Place pork belly, garlic, salt, peppercorns and bay leaves into a pot. Pour in water just enough to cover the ingredients. Boil for 2 mins, skimming froth off the water surface. Then, simmer for 1½ hours until meat is tender. 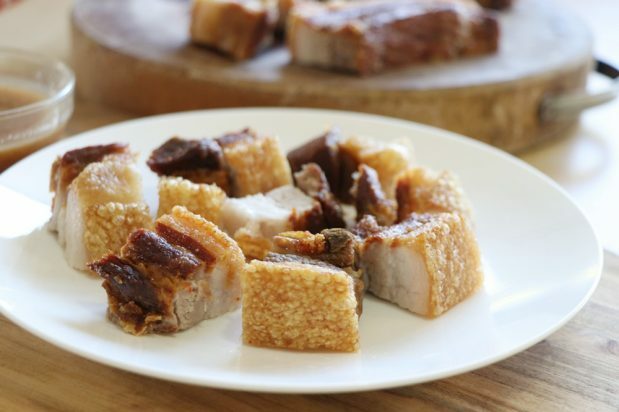 Remove pork and pat dry with paper towels, removing any stray aromatics. Refrigerate overnight. Heat oil (enough to cover the pork) in a large pot to 190 degrees Celcius. Deep fry pork until deeply browned and skin has bubbled and puffed. Dish the pork out and drain on a wire rack. Allow to rest for 5 mins before cutting into bite-sized pieces. Serve immediately with lechon sauce or a dipping sauce of your choice.